Consolidation Period: From February 12, 2018 to the e-Laws currency date. Legislative History: 263/12, 149/14, 88/15, 174/15, 41/16, 323/16, 17/18. (b) Mississauga Transit. O. Reg. 149/14, s. 1 (1). (b) a bus line operator operating on behalf of the OC Transpo Corporation, but only with respect to those of its buses in which a valid placard issued by the OC Transpo Corporation is displayed in its front windshield. O. Reg. 149/14, s. 1 (1). (1.2) Those parts of the King’s Highway described in Schedule 3 are designated as having paved shoulders for use by a bus operated in accordance with a licence issued under the Public Vehicles Act and an authorization provided by the Ministry by Grand River Transit, also known as GRT. O. Reg. 149/14, s. 1 (1). (b) Greyhound Canada, but only with respect to those of its buses providing a scheduled service. O. Reg. 17/18, s. 1. (d) a road service vehicle actively engaged in road construction or maintenance activities on or near the paved shoulder. O. Reg. 618/05, s. 1 (2); O. Reg. 149/14, s. 1 (2); O. Reg. 41/16, s. 1 (1-3). (3) No person shall drive or stop a vehicle on a paved shoulder of a part of the King’s Highway designated under subsection (1), (1.1) or (1.2), except as permitted under subsection (1), (1.1) or (1.2), as applicable, or subsection (2). O. Reg. 149/14, s. 1 (3); O. Reg. 41/16, s. 1 (4). (b) a vehicle being disabled while on a highway. O. Reg. 618/05, s. 1 (4). 1. A sign that has the dimensions and bears the markings illustrated in Figure 1. 2. In an area designated in the Schedule to the French Language Services Act, a sign that has the dimensions and bears the markings illustrated in Figure 2, in addition to a sign described in paragraph 1. Text alternative: Illustration of a ground-mounted sign labelled as “Figure 1”. The sign contains two rectangles, stacked on top of one another. The top rectangle contains the words “DO NOT DRIVE ON PAVED SHOULDER” in black lettering on a white reflective background. The bottom rectangle contains the words “AUTHORIZED BUSES EXCEPTED” in white lettering on a black reflective background. The following measurements are written below the sign: (90 x 180) cm. The sign is surrounded by dimensions of its different elements. This text alternative is provided for convenience only and does not form part of the official law. Text alternative: Illustration of a ground-mounted sign labelled as “Figure 2”. The sign contains two rectangles, stacked on top of one another. The top rectangle contains the words “INTERDIT DE CIRCULER SUR L’ACCOTEMENT” in black lettering on a white reflective background. The bottom rectangle contains the words “EXCEPTÉ AUTOBUS AUTORISÉS” in white lettering on a black reflective background. The following measurements are written below the sign: (90 x 180) cm. The sign is surrounded by dimensions of its different elements. This text alternative is provided for convenience only and does not form part of the official law. O. Reg. 618/05, s. 2 (1); O. Reg. 88/15, s. 1 (1). 1. A sign that has the dimensions and bears the markings illustrated in Figure 3. 2. In an area designated in the Schedule to the French Language Services Act, a sign that has the dimensions and bears the markings illustrated in Figure 4, in addition to a sign described in paragraph 1. Text alternative: Illustration of a ground-mounted sign labelled as “Figure 3”. The sign contains two rectangles, stacked on top of one another. 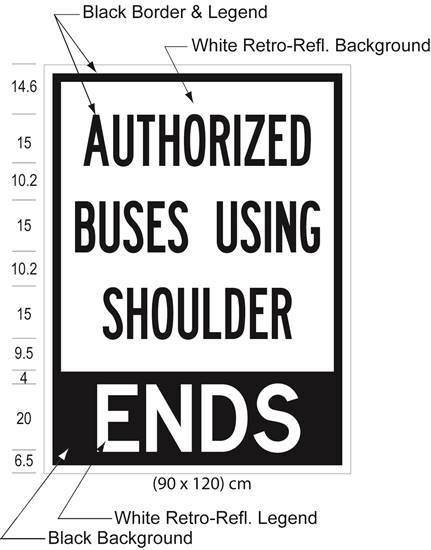 The top rectangle contains the words “AUTHORIZED BUSES USING SHOULDER” in black lettering on a white reflective background. The bottom rectangle contains the words “BEGINS” in white lettering on a black reflective background. The following measurements are written below the sign: (90 x 120) cm. The sign is surrounded by dimensions of its different elements. This text alternative is provided for convenience only and does not form part of the official law. Text alternative: Illustration of a ground-mounted sign labelled as “Figure 4”. The sign contains two rectangles, stacked on top of one another. 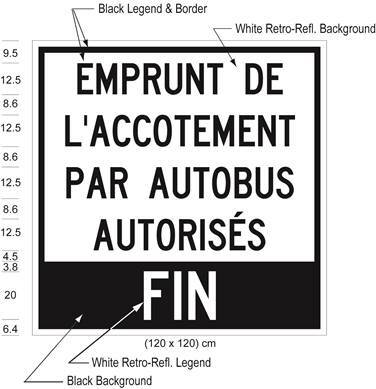 The top rectangle contains the words “EMPRUNT DE L’ACCOTEMENT PAR AUTOBUS AUTORISÉS” in black lettering on a white reflective background. The bottom rectangle contains the words “DÉBUT” in white lettering on a black reflective background. The following measurements are written below the sign: (120 x 120) cm. Measurements for the height of the lettering and horizontal spacing between the lines of text appear to the left of the sign. This text alternative is provided for convenience only and does not form part of the official law. O. Reg. 618/05, s. 2 (2); O. Reg. 88/15, s. 1 (2). 1. A sign that has the dimensions and bears the markings illustrated in Figure 5. 2. 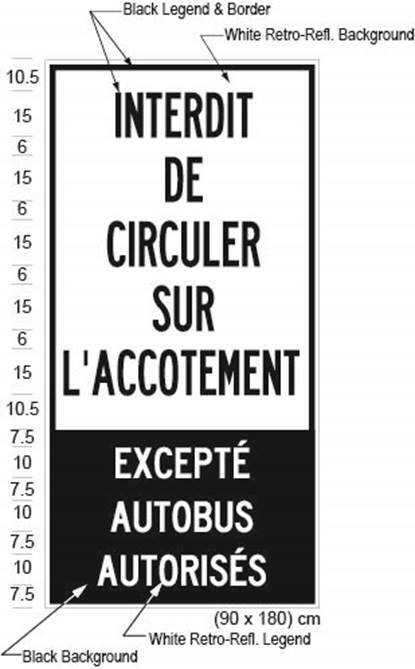 In an area designated in the Schedule to the French Language Services Act, a sign that has the dimensions and bears the markings illustrated in Figure 6, in addition to a sign described in paragraph 1. Text alternative: Illustration of a ground-mounted sign labelled as “Figure 5”. The sign contains two rectangles, stacked on top of one another. 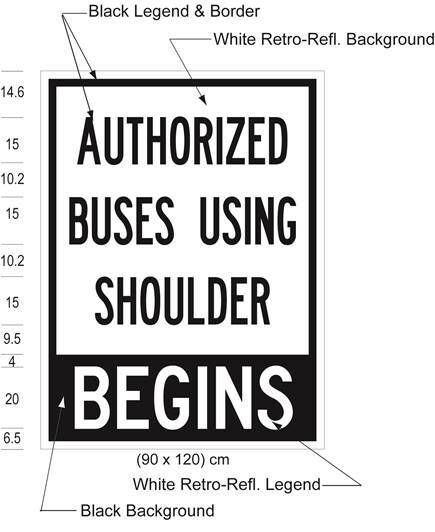 The top rectangle contains the words “AUTHORIZED BUSES USING SHOULDER” in black lettering on a white reflective background. The bottom rectangle contains the words “ENDS” in white lettering on a black reflective background. The following measurements are written below the sign: (90 x 120) cm. Measurements for the height of the lettering and horizontal spacing between the lines of text appear to the left of the sign. This text alternative is provided for convenience only and does not form part of the official law. Text alternative: Illustration of a ground-mounted sign labelled as “Figure 6”. The sign contains two rectangles, stacked on top of one another. 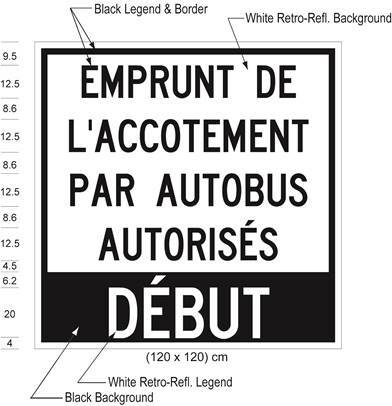 The top rectangle contains the words “EMPRUNT DE L’ACCOTEMENT PAR AUTOBUS AUTORISÉS” in black lettering on a white reflective background. The bottom rectangle contains the words “FIN” in white lettering on a black reflective background. The following measurements are written below the sign: (120 x 120) cm. Measurements for the height of the lettering and horizontal spacing between the lines of text appear to the left of the sign. This text alternative is provided for convenience only and does not form part of the official law. O. Reg. 618/05, s. 2 (3); O. Reg. 88/15, s. 1 (3). (4) The dimensions of a sign may be greater than the dimensions prescribed in subsection (1), (2) or (3) so long as each dimension is increased and, when increased, has the same relation to the other dimensions of the sign as the prescribed dimensions have to each other. O. Reg. 618/05, s. 2 (4). (5) A ground mounted sign shall be erected on the side of the highway facing approaching traffic. O. Reg. 618/05, s. 2 (5). 3. Omitted (revokes other Regulations). O. Reg. 618/05, s. 3. 4. Omitted (provides for coming into force of provisions of this Regulation). O. Reg. 618/05, s. 4. (b) in the westbound direction, between a point situate 737 metres measured westerly from the intersection of Highway No. 403 with the centre line of Mavis Road and a point situate 210 metres measured easterly from the intersection of Highway No. 403 with the centre line of Erin Mills Parkway. O. Reg. 618/05, Sched. 1. (f) in the westbound direction, between a point situate 438 metres measured westerly from the intersection of Highway No. 417 with the centre line of St. Laurent Boulevard and a point situate 900 metres measured easterly from the intersection of Highway No. 417 with the centre line of Vanier Parkway. O. Reg. 263/12, s. 2; O. Reg. 174/15, s. 1; O. Reg. 41/16, s. 2. (d) in the westbound direction, between a point situate 1300 metres measured westerly from the intersection of Highway No. 8 with the centre line of Sportsworld Drive and a point situate 800 metres measured easterly from the intersection of Highway No. 8 with the centre line of Fairway Road. O. Reg. 149/14, s. 2. (e) in the eastbound direction, beginning at a point situate 673 metres measured easterly from the intersection of Highway No. 401 with the centre line of Trafalgar Road and extending easterly for a distance of 827 metres. O. Reg. 323/16, s. 2.